TWEETSTORM to Stop the Execution of Zanyar & Loghman Moradi! Please join the tweetstorm to stop the execution of Zanya & Loghman Moradi! Wednesday 8 & 9 January at 3PM EST, 7PM London, 12PM PST, 8PM Berlin, 10:30PM Tehran. 1. #FreeMoradis JOIN THE TWEET STORM to stop the execution of political prisoners in #Iran, Zanyar & Loghman Moradi. 2. #FreeMoradis Tweet Storm: find suggested tweets here on FB: http://on.fb.me/TI3XqP NOT ONE MORE EXECUTION IN #IRAN! 26. #Iran regime targeting Zanyar & Loghman b/c Zanyar’s dad’s a member of Komala #FreeMoradis @UN @StateDept @eu_eeas NO EXECUTION! B. DIRECTIONS FOR TWEET STORM TO STOP EXECUTION OF ZANYAR & LOGHMAN MORADI IN IRAN: TUESDAY, 8 JANUARY AT 3PM EST, 7PM London, 12PM PST, 8PM Berlin, 10:30PM Tehran. 2. You can copy the suggested tweets and paste straight to your Twitter account. Please make sure the special hashtag (#FreeMoradis) is included, along with the #IRAN hashtag if there is room. 3. Please do not use the special hashtag (#FreeMoradis) prior to the scheduled TweetStorm (3pm EST, 10:30pm Tehran time) as doing so reduces the chance of “trending” on Twitter. 4. Note that if you tweet too fast Twitter will detect it and consider your action spamming. One tweet a minute or every 40 seconds is good. A: You’re supposed to tweet content related to the goals of the campaign. You can either create your own original tweets or copy the tweets that the campaign has suggested. Just remember to include the special hashtag (#FreeMoradis) with every tweet. WHY DO I NEED TO INCLUDE THE SPECIAL HASHTAG? A: When you include the special hashtag (#FreeMoradis), you are ensuring that your tweet gets included in the campaign. In return, you contribute to the growth of the campaign. The more recognition the campaign gets, the more chance we have of trending the special hashtag on Twitter, which in turn brings even more attention to the campaign – and pressure on the regime to stop their execution. DO I HAVE TO PARTICIPATE FOR THE FULL HOUR EVERY DAY? A: No. You can even tweet only once if you wish. We should all participate as much as our time allows us. We should all just do our part to contribute to the success of the campaign. IS IT TRUE THAT IF YOU TWEET TOO FAST TWITTER SUSPENDS YOUR ACCOUNT? A: If you tweet too fast, Twitter will sense it and suspect you are spamming. In order to avoid any issues, it is best to tweet once every 40 seconds to a minute. Spacing out your tweets is very important. CAN I PARTICIPATE IF I DON’T HAVE A TWITTER ACCOUNT? A: No. You will need a Twitter account or access to one in order to participate in a Tweet Storm. You can simply open a Twitter account. It doesn’t have to be a personalized Twitter account with your personal or private information listed. Also, please make sure your Twitter account setting is set to public. PLEASE BE CAREFUL HOW MANY TIMES YOU TWEET TO AN @ RECIPIENT. TWITTER WILL SUSPEND OR CLOSE YOUR ACCOUNT FOR SPAMMING IF YOU TWEET MULTIPLE TIMES TO AN @ RECIPIENT. 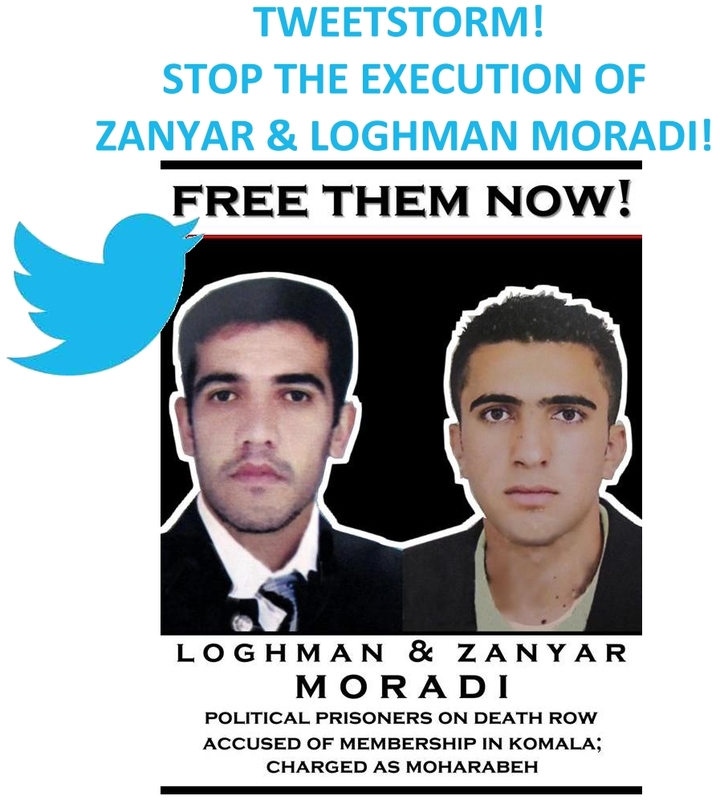 This is an URGENT tweetstorm action in support of Zanyar and Loghman Moradi, two political prisoners in Iran at imminent risk of execution on trumped-up political charges (participation in a political opposition party) and criminal charges.